The Stock Bull Market Stops Here! The definition of a bull market or bull trends widely vary. One of the more common criteria for bull markets is determined by the asset being above or below its 200 day moving average. In my humble opinion, each index above remains in a bull trend, as triple support (200-day moving averages, 2-year rising support lines, and February lows) are still in play at each (1). With each index now below its 50 and 100 day moving averages should these triple support points at each (1) break to the downside, the Power of the Pattern would not be surprised to see selling pressure ramp up. 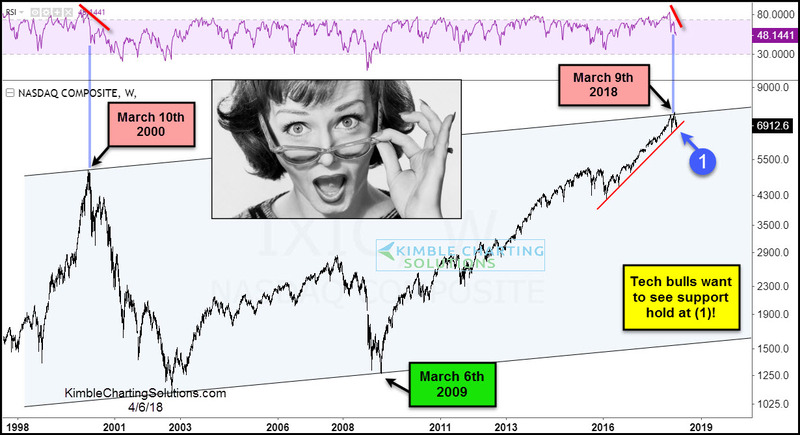 Will this March represent another key turning point for this key Tech index? The Nasdaq Composite has spent the majority of the past 16-years inside of the blue shaded rising channel. The high in 2000 took place on 3/10/2000 as momentum was lofty and turning lower. The low in 2009 took place on 3/6/2009 as momentum was oversold and turning higher. Did a high take place at the top of the 16-year channel on 3/9/2018 as momentum was lofty and turning lower? In my humble opinion, I don’t know at this time. I am of this opinion, if support would not hold at (1), I wouldn’t be surprised to see selling pressure continue to take place in this index and the FAANG stocks! Bottom line- Bull trends are still in play and the action of the 6-weeks has not changed them. If each triple support test at (1) in the 4-pack above and the support point at (1) in the Nasdaq would fail to hold, intermediate (2-year) bull trends could be coming to an end.